Orbital ATK is developing a new rocket technology in a bid to become the U.S. Air Force‘s supplier of a Next Generation Launch system intended for national security missions, KSL.com reported Sunday. 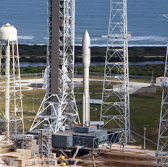 Kay Anderson, senior communications coordinator at Orbital ATK, told the publication that the company and the military service have invested a combined $200 million on the rocket development project as of 2017. She added the Air Force looks to down-select two NGL designs by summer and select a final model in two years. Orbital ATK signed a cooperative research and development agreement with the Air Force earlier this year as part of efforts to obtain certification to help the branch launch national security payloads into space. The company aims to begin a ground test of its NGL offering in September, according to Anderson.